Inherent Vice: Late 60’s permastoned private eye Doc Sportello's ex-girlfriend reappears and tells Doc about her current billionaire boyfriend and a plot by his wife and her lover to kidnap him and throw him in an insane asylum, and sends him on a quest for answers. What I have to give Vice a lot of credit for is it’s sense of humor. It’s jokes have a flavor to them that are not only uniquely Paul Thomas Anderson, but I would say are uniquely Inherent Vice, and star Joaquin Phoenix carries that original style expertly. But it’s unbelievably boring and long. It’s three hours of kinda-funny screwed up people talking. By the end I wanted to claw my brain out of my ears because that was the only thing that would keep me awake. It’s confusing, it’s monotone, and it’s unpleasant to sit through. Paul Thomas Anderson’s previous films have moments in them that I will never forget, so Inherent Vice was was a grandiose disappointment. The humor of this movie would probably be a lot of fun with a group of friends, but in a dark lonely theater, every minute was like a tumultuous step through a dense thicket of drug-tainted quirkiness. You may like this movie if you’re an insufferable hipster and you prefer being slightly amused to being emotionally moved in any capacity. So we’re giving it 2.5 chocolate covered bananas out of 5. Why chocolate covered bananas? See the movie to find out. 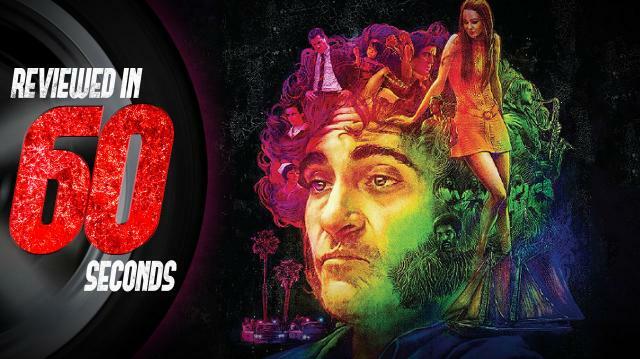 Inherent Vice is in theaters limited release on December 12th, and getting its wide release on January 9th 2015.